The saltwater fishing magazine for America's West Coast and beyond! It’s that time again! Yes, it is time for the 10th annual Pacific Coast Sportfishing Tackle, Boat and Travel Show. The show will be held at the OC Fair and Event Center for the 10th year straight. Mark down Feb. 15, 16 and 17 with show hours, Friday, 1-7 p.m., and Saturday and Sunday, 10 a.m. to 5 p.m.
Once again top tackle dealers from our area showcase the latest and greatest. They will have some of the best deals of the year, and our show is the first opportunity you have to take advantage of them. Also, some of the top fishing boat brands—such as Grady White and Parker Boats and many more—unveil their new models. If you are looking to travel, we have you covered with prime destinations from Tropic Star Lodge in Panama to Mexico, Alaska and British Columbia. Bring the family as there will again be a free, kids-only trout pond in the building! Our seminars continue to be the most in–depth on the West Coast. A sampling of what will be on tap follows. “Top Four Orange County Coastal Hot Spots,” with longtime local experts dishing out the goods and covering the whole gamut of opportunities. Learn from top captains Dave Hansen and Jamie Thinnes where to consistently catch coastal fish. From the tackle to the specific numbers, they will dial you in. Be ready to take your shot at some of our largest homeguard yellowtail as well as some huge white seabass from these spots. Another great topic, and one you won’t want to miss, will be the “Running and Gunning Yellowtail.” This is a tried and true technique, but not many have mastered it. Captain Todd Mansur, Jimmy Decker and Erik Landesfeind will walk you through the process that will change the way you score these jacks. These last few years have turned out some epic surface action on yellowtail from the coast to the islands. Up your game! One of the show favorites is always the Catalina Island seminar focused on catching exotics, from yellowtail to white seabass. Captains Joe Barian and Mark Wisch will teach you what times of the year to head out, what spots to focus on and how to increase your odds of going home with a bag of exotics. They will be walking you through the step-by-step process of turning a trip to Catalina from a bass day to an exotics day. Use specific spots, techniques and tackle tips to change your outlook on fishing the nearby island and coming home with the goods. Captain Billy Keleman will be giving up some of the hottest tips that helped him to bag a grip of big bluefin this year. There is so much intel here, Saturday with a Part 1 and Sunday with a Part 2. Keleman will be covering tips and tactics on using the frozen flying fish via the kite and helium balloons. Captain Billy put his customers on over 30 cow bluefin in the 2018 season and helped countless others accomplish this goal on their private boats. There were small but critical details that made his year extremely successful getting on the fish when most could not figure out where they were. Traeger is once again sponsoring us with Pellet Grills to give away each evening, Friday at 6:15 p.m. and Saturday and Sunday at 4:30 p.m. You must be present to win. We will also be giving away a free beer to the first 50 through the door each day (21 years of age and over only). The first five will receive a pair of polarized Bomber Glasses, and there will be many more giveaways each opening. Get ready to enjoy a sportfishing show that is for you, the Southern California angler! 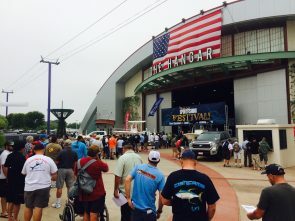 For more information, visit us online at www.sportfishingfestival.com. Local Bluefin Foaming Up Down The Coast! 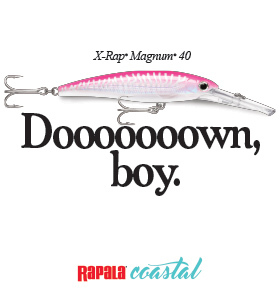 © 2019 Pacific Coast Sportfishing Magazine. All rights reserved.